Click here for a printable hand-out to share with others. 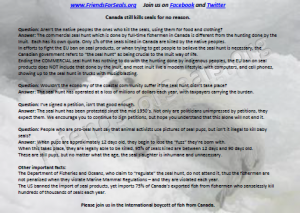 Please contact these people now and tell them you are encouraging Canada’s citizens not to vote for politicians who support the seal hunt. Canada exports most of it’s fish (75%) to the U.S..